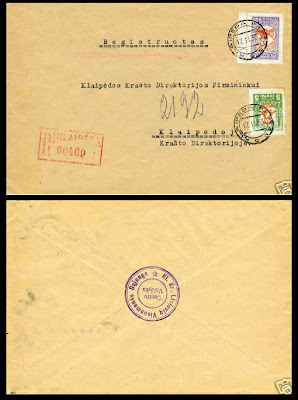 Registered cover within Klaipeda (Memel) dated 17 February 1933. Local urban letter rate of 15 ct. plus registration fee of 30 ct. Klaipeda Pastas "O" cancellation. Klaipėdos krašto Lietuvių Visuomenės Sąjunga cancellation on other side.